80% open rate, 20% average click-through rate, and 1.3 billion active daily users. What is this unmatched marketing channel?! 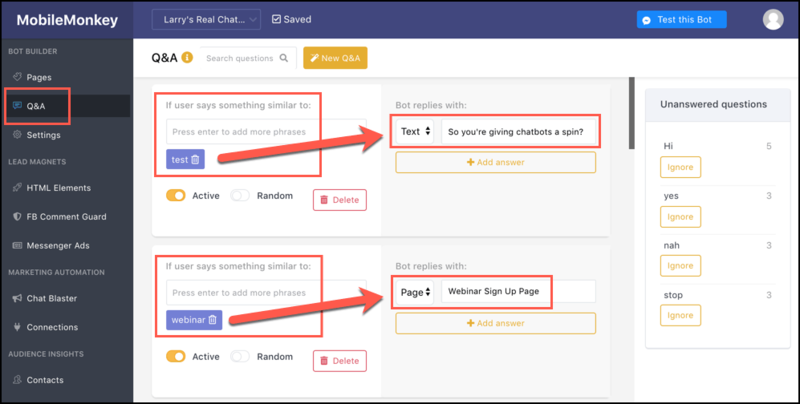 Consider this the complete guide to using Facebook Messenger and automation tools as a marketing channel with monster engagement and scalable lead-driving abilities. Marketing hacks get more traffic, more sign-ups, more leads, faster. 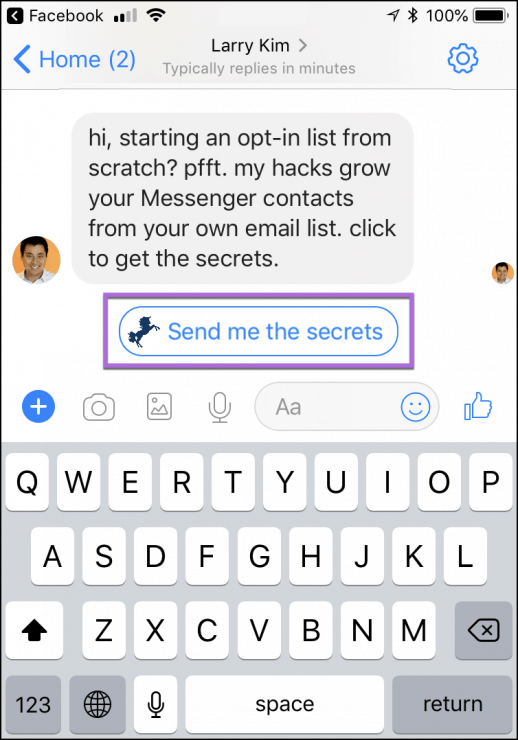 Facebook Messenger hacks take advantage of the new marketing channel introduced in 2016 when Facebook released and API for Facebook Messenger. Facebook Messenger is the most widely used messaging application in existence. Around 1.3 billion people use it every month, making it a stellar platform for reaching new customers and nurturing existing ones. And yet less than 1% of businesses use Facebook Messenger to connect with customers. 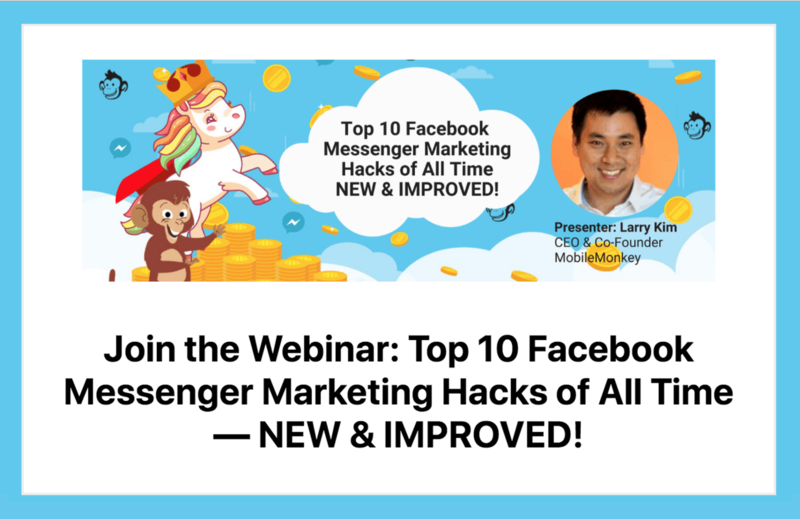 Here, we’ll show you the right tools and how to use them to execute lead generating Facebook Messenger hacks. 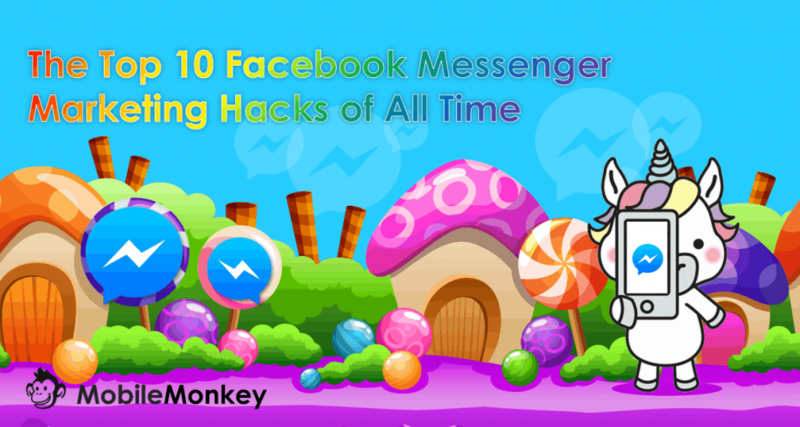 Here are the top 10 Facebook Messenger marketing hacks of all time to grow your business. You can reach anyone on any device at any time. Chat blasting is the act of sending mass messages to everyone in your messenger contact list (or even segmenting by audiences). For example, you could send a blast of your latest blog post to your entire contact list. In MobileMonkey, you can do this directly in the Chat Blaster tool, scheduling your blasts in advance or pushing them live immediately. So, does it work? How does it compare to email marketing or posting on the Facebook News Feed? The engagement rates are 10-80x better. Chat blasting is the gold standard of Messenger hacks. Sending email blasts only generate a 5-10% open rate. Why? Because email is too saturated. Less than a percent of companies are using Messenger to engage users. Chat blasting will help you drive huge open rates in the first hour alone. Speaking of chat blasting, here are nine awesome ways to chat blast for huge engagement rates. One of the biggest complaints about live chat software is spending far too much time answering basic questions like FAQs. Processes exist on your site already, but users would rather message you to get a quick response. Using keyword detection and AI with chatbots for natural conversation and answering those tedious questions about your business. Essentially, you are setting trigger words or phrases that commonly occur and designating the bot to respond with a specific message or link. This way you don’t need to staff employees to deal with easy messages all day! With Unanswered questions, you can turn common questions (essentially like search keywords) into new Q&A responses. 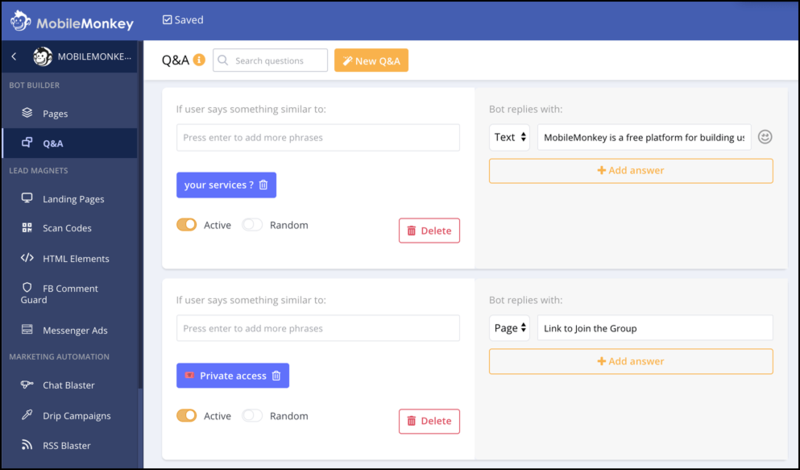 Learn how to use MobileMonkey to set up automated Q&A chatbots here. 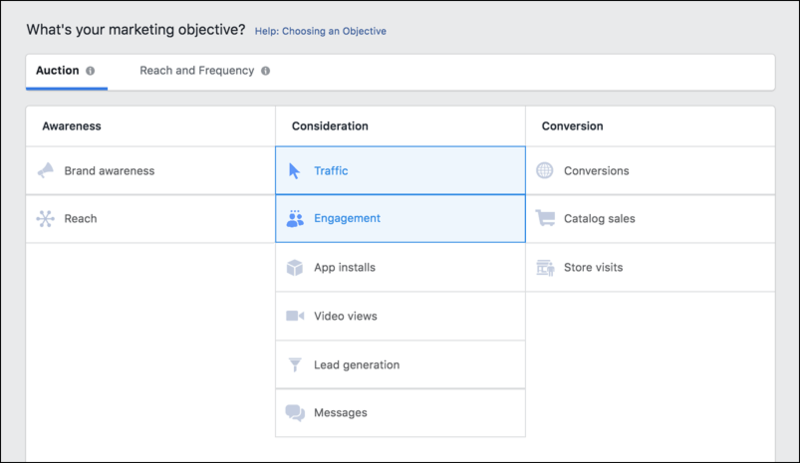 When using Facebook to drive your lead generation or capture more traffic, what’s your go-to objective campaign type? Engagement? Traffic? These are the top two most common objectives. Think again. Being the most widely used objectives, users are all too familiar with them. Plus, there is an objective type that almost no brands are utilizing right now: send-to-Messenger ads. This is an example of a click-to-Messenger ad that MobileMonkey recently ran. When a user engages with the message ad, it doesn’t bring them to your website or Facebook profile or a landing page. If you are using chatbots, which you should be, you can automate the entire process so that you never lose communication opportunities with a customer due to slow response times or missing a chat notification. 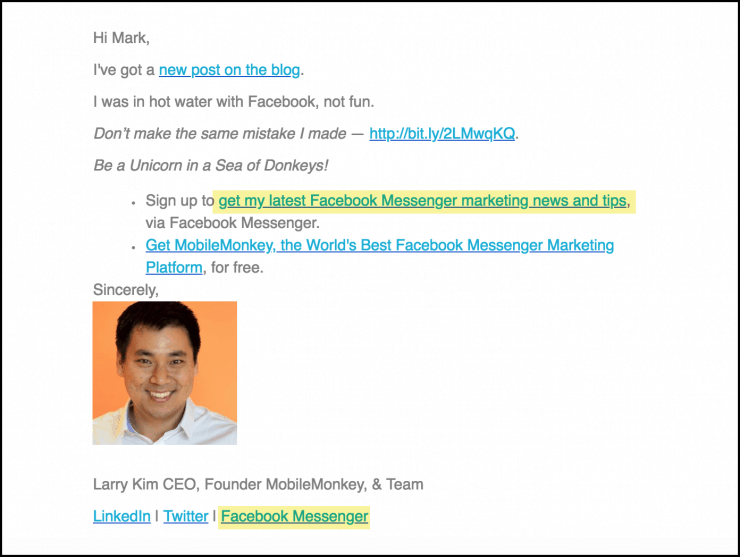 Using this tactic on a small $130 budget, MobileMonkey generated 26 new conversations/leads. That’s a cost per result of just $2.59. Even if they didn’t chat with us, they still opted-in if they clicked “Send Message,” meaning we captured even more contact info that Facebook analytical data didn’t show! Forget the donkey tactics of clicks, engagement, and traffic. Follow our guide and build a send to message campaign that explodes your ROI. In our changing era of virtual communication, contact forms are slowly dying. Contact forms are slowly dying. Lead gen is happening conversationally, not in a static, boring form that your customers dread filling out only to hear back a week or a month later when they’ve moved on with their lives. You don’t even have to overhaul your existing setup! You don’t need to get rid of forms entirely and quit your marketing tactics cold turkey. In fact, that’s probably a bad idea. On your landing pages, include this secondary way for users to get the information they are looking for. Not only does it ensure that they get in contact with you faster, but it allows you to add them as a contact to perform even more Messenger campaigns to them in the future. This opt-in strategy has increased conversion rates on all of my website forms dramatically. Within MobileMonkey, you can add the opt-in checkbox to any form on your site from the HTML Elements dashboard. Simply create a new HTML element and select the Checkbox type. Lastly, paste the code on your site forms and voila! In addition to the checkbox opt-in, you should also get your email subscribers into Messenger. Email marketing is far from dead. But it’s also far from the strength it had when email marketing first surfaced. Just like most marketing tactics, they fade over time. Print advertising used to be the gold standard, and now it’s reserved for a few companies with a worldwide reach. Emails are great to have, but using email alone to contact customers or share content isn’t maximizing your business growth potential! Instead of solely relying on email to get the job done, incentivize email subscribers to sign up for your Messenger campaigns too. 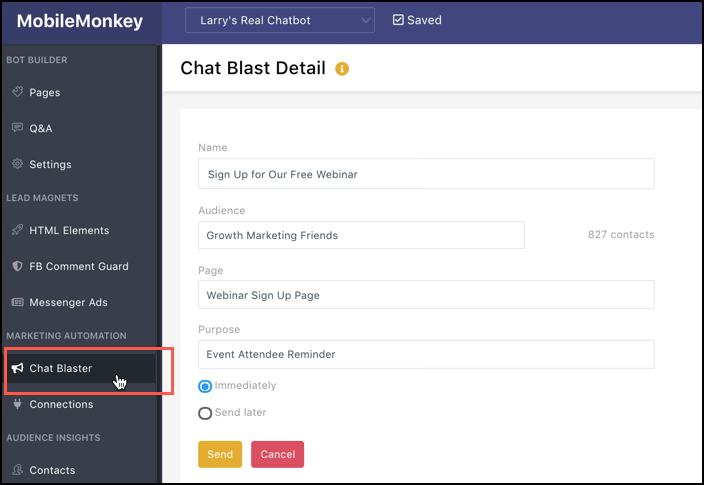 In MobileMonkey, you can create an opt-in link like this that takes users directly to a chatbot landing page where they can confirm their subscription. Follow this guide to create a messenger subscription opt-in page that can accompany your email campaigns for improved, multi-channel results. Chat features on websites are abundant now, and they’re great. On-site chat can drive up conversions, answer frequently asked questions, give a user peace of mind that they’re ordering the right thing or even help them solve common problems. When a user leaves your website, you lose chat history, and you can’t follow up. Why? Those platforms are exclusive to your website! If they visit on mobile, it will treat them like just another random customer even if they have engaged before. Were you in the middle of a conversation about pricing and they left? You can’t continue that conversation until they come back. That’s bad news for lead generation. But with Facebook Messenger chat on your site, you can create lasting customer profiles enriched by every interaction that allows you to follow-up with personalized, relevant content and offers. This simple hack can explode your growth potential. Using MobileMonkey, you can easily add Messenger to your WordPress site or any website using Google Tag Manager. 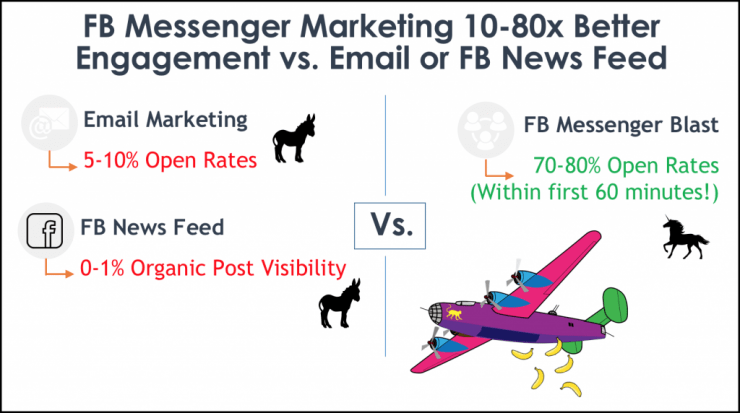 One of my favorite hacks of all time for Messenger marketing is to develop messenger-based landing pages. Typical landing pages are abundant in the marketing world. But more often than not, they contain long forms or are impossible to use on mobile. By creating a Messenger-based landing page, you can easily send traffic to opt-in via Messenger and collect data without them needing to enter a single form field! Using MobileMonkey’s visual content building, you don’t need to touch any coding. Want to develop your own? Here’s how! Once you’ve developed your landing pages, start using the link as your call to action to drive unprecedented opt-ins and grow your contacts like you never imagined. Webinars are perfect for growing your business through lead generation at each stage of the funnel. If you are looking to capture new, non-brand-aware users, they’re perfect. Want to move those newly aware users down the funnel? Give them a higher level webinar and additional resources tapping into their biggest pain points. The problem that most face with webinars is burnout/lead drop-offs. Getting people to sign up is tough when you’re sending invitations through email and when the sign-up form is clunky on mobile. People get hundreds of emails daily, and the odds of yours getting lost in the shuffle are exponentially higher. That’s much easier than engaging with a website CTA for a webinar and entering tons of informational details. 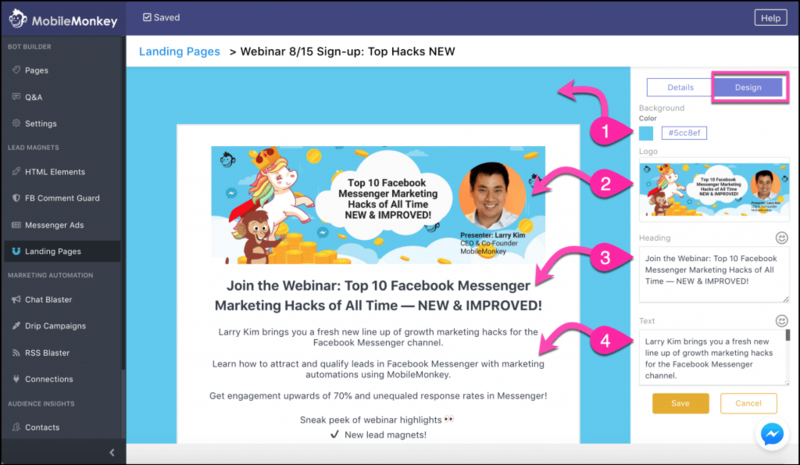 Using some nifty hacks that we discuss here, you can even set up reminder messages like drip campaigns to re-engage users and ensure that you get them to the webinar when it goes live. So, what are you waiting for? Go out there and convert more webinar users than you could ever have imagined using Facebook Messenger marketing. Connecting with customers is harder than it’s ever been. CTAs at the end of blog posts can capture emails well, but getting a customer to read the email you send them is a feat within itself. There is simply too much competition. Too many emails. Too many brands looking for attention. That’s if they even get delivered to the inbox. Including a CTA to deliver occasional updates and hacks to their inbox is more engaging than email. It’s a win-win situation for users and your business. They don’t have to worry about giving out their email, and you can connect with them better than ever with almost zero competition! When asking people to connect with you, build an opt-in page that you can use as your CTA link. Here’s how to build one that you can use for your CTAs. 10. Do It All in Chat With Integrations! No Need to Send Them to a Different Channel. You’ve probably heard of marketing tactics like multi-channel and omni-channel marketing. They’re great tactics that focus on delivering a marketing experience seamlessly between your website, social, and any other platform that you occupy. An experience that doesn’t force users to jump from Facebook to a landing page to a phone to a mobile site to SMS. One where the user experience transitions are smooth from platform to platform. And Messenger is an amazing place to do just that. With Messenger marketing, you have nearly countless options for developing CTAs that your customers want. You don’t even have to bring people off your chat to deliver the goods. Sending them from channel to channel isn’t a fun user experience. That’s more pages to load and more time between them and the end product they opted-in for. Instead, you can use different widgets in MobileMonkey to deliver content directly in your conversation! 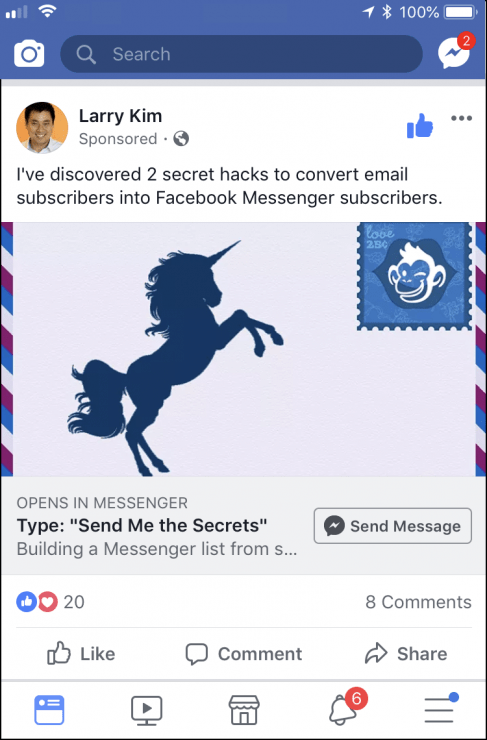 For example, you can run a send to messenger ad for a lead magnet PDF that delivers the PDF directly in the message with your acquired lead for easy conversions. Or you can even deliver on-demand webinars through native video using the “Video” widget in MobileMonkey! The options are almost endless for doing it all in chat. With diverse integrations, you can connect the data you collect in Messenger to other business applications to assess your KPIs, too. Forget directing users away, keep them engaged with integrations and content directly in Messenger. On Messenger, you can reach billions of daily active users with the touch of a button. But less than 1% of businesses are utilizing this tool right now for business growth. Using Facebook Messenger on its own requires tons of coding knowledge, setup work, and effort. It has a significant barrier to entry if you just use Facebook’s API. In chat integrations are king! Now is the time. Use these top ten hacks and grow your business like never before.